It's not enough that I dove all day. I got sunburned and am fairly oozing nitrogen from my pores. No, that's not enough. I want more. 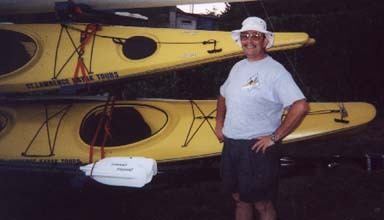 So I decide to learn about kayak touring while I'm here in Canada. I found a flyer for a place that sets you up. I called and Ron said they could accomodate my quirky schedule (starting after I get back on the boat from diving). I'm sure Ron must have shook his head. He might even have figured me for a no-show. It was an aggressive plan. In fact I was wiped more than usual, and thought about bailing, but I had let the idea fester and now was committed. 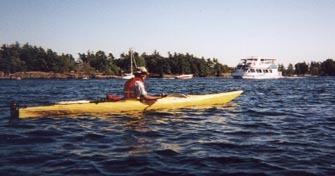 Our plan was to paddle upstream for a couple hours along and among the 1000 Islands (there are actually 1800 of them, roughly divided between the US and Canada). We'd then enjoy the easy cruise back with the current. First things first. I'd just learned to whitewater kayak so I knew just enough to be annoying. Ron was very patient with me and didn't once scream. So, it's longer. It's got a rudder (the foot rests move!). You need a bilge pump. This ain't no whitewater kayak! I was obssessed with ideas of rolling it. What's the old saying? If all you have is a hammer, pretty soon everything looks like a nail? Bingo. I calmed down in time. I was just trying to paddle in a single compass direction. Not for 30 minutes did I realize that I was futzing with the rudder everytime I pressed my feet on one side or the other. Using the rudder properly definitely helped. It was tough going, but we stuck close to shore to minimize the futility. We passed many awesome homes. One had a large wooden deck out over the water designed to look like the stern of an old sailing ship, a galleon perhaps. Ron told me how the islands were counted, which was an issue, since there were shoals almost peaking out and rocks sticking out nearly everywhere. If the place is at least 1 meter high at high tide and has 2 or more trees, it's an island. Otherwise, it's just a shoal. We passed the anchor for the Lillie Parsons. She is the very old wreck of a freighter that capsized in the night and sits just 40 feet down on a steep shoal. As a diver, I'd pondered the symmetry of a wreck upside-down, under water, with its anchor on land. Now, I got a closer look at it from the surface. It's just as weird. Ron pointed out a large rock cliff next to a lighthouse. Kids were jumping off the rock and plummetting at least 20 feet into the river. "We used to jump off the lighthouse when we were kids," Ron said wistfully. Now it's illegal. Ron also explained about the wreck of the John B. King. A storm was coming in fast on June 30, 1930. A barge filled with dynamite was anchored here, intending to ride it out. Everything else afloat was fleeing to safe harbors. Across the quarter-mile of the river on the Canadian side, a large garden party was convening. They would have their outdoors session, and then move indoors as the weather dictated. It was a swanky affair. One small boat came along the John B. King (the dynamite barge) and the lone occupant was convinced to stay on the barge for the duration. Not long afer that, lightning struck. The John B. King went up in a cataclysmic rage. The wives doing the party prep were deafened. The storm and lightning meant there would be only a token rescue effort. There was only one survivor. Yep, the guy from the small ship. He retired immediately and gave tours of the site until his death. We paddled through a connected series of coves. Ron pointed down at one point and I saw we were above an old wooden barge hardly a few feet down. It was an old thing, according to Ron. Built in 1890 and sunk in 1950. It's often used for the discover scuba intro experience. I was stunned. A century old wooden wreck no more useful than for glorified snorkeling. This really was a mecca for wreck diving. So, we don't want to get run over by the card-playing maniacs in rocket-powered boats, eh? The problem is that you can look both ways and they'll still hit you from beyond the horizon. Don't expect them to avoid you. Once set, their course is a foregone conclusion. I was in full Woody Allen mode. I don't remember my precise internal monologue, but it was funny in a hope-I-get-to-tell-someone-about-this kinda way. The dangerous crossing out of the way, we picnicked on one of the small islands and then headed home. We took slightly more than 2 hours heading up about 4 miles, and just 45 minutes to get back. We did stay out in the middle of the river for most of that return. We skirted some islands and generally got the feel for being "out there". I liked it.